Our article on open access published by Light Reading seems to be a hit. We're getting a lot of feedback, particularly from the US. "Open Access" is experiencing a return to prominence in fixed telecoms. Sadly, the term "open access" is increasingly and deliberately being distorted by some broadband operators that claim to provide it when in reality they do not. It's a bit like "fiber broadband," which can leave some customers scratching their heads when they look at the copper connection into their homes: There is no legal or industry standard definition of open access, and the term is therefore widely abused. On the other side, I frequently see RFPs for town networks (yes, I'm looking at you, the US of A) that specify open access without the author really understanding what it is and how the business model should work. So given it's all a bit confusing, this article will attempt to define what real Open Access is for FTTH networks and also define the questions that municipalities, smart cities, developers, campuses etc. should be asking any operator. It's based on my colleagues' hard-earned experience in creating and running 120+ open access networks across three continents over the years. So what is Open Access in the last mile? Firstly, when I talk about Open Access, I'm referring to the part of the network that delivers the service to residential and business customers, not the inter-city network or metro networks that transport services around/between towns and cities. This last connection to the customer, the "last mile" or the access network, is specifically what is being discussed here in terms of Open Access. The European association of regulators, BEREC, states there is no agreed definition for Open Access, a situation that has enabled the use and misuse of the term. The basic concept is clear, though -- an Open Access FTTH network is open to be used by multiple service providers simultaneously and on equal terms, providing a real choice for the end customer. This makes the network more attractive and delivers higher take-up, which is the number one value driver. Open Access can drive greater take-up and revenues for both property and fiber owners but is normally outside their domain or experience. Choosing the right equipment, systems and especially the right configuration for a large complex network is a challenging task. It can be technically very difficult to get right and can be daunting for many fiber owners to take this step. So Open Access is much better for the real estate fiber owner and is more popular with end-customers. As is often the case, the devil is in the detail. 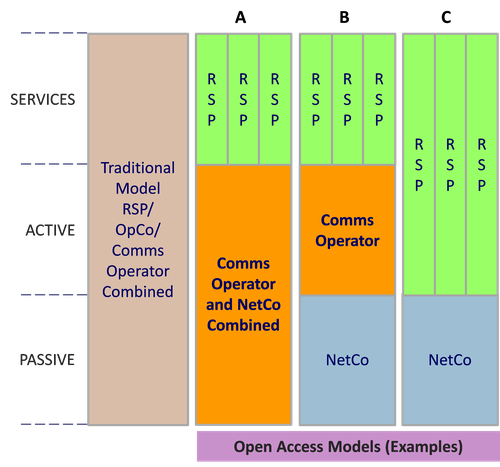 Unlike the traditional network shown on the left in the diagram above, Open Access network models (A, B and C) separate the management of the network from the supply of services by Retail Service Providers (RSPs). In Sweden, a long period of Darwinian market evolution has led to case B dominating with a firm acting as a Communications Operator to manage the network for the fiber owner and ensure multiple service providers can deliver a range of different services simultaneously to customers. Open Access model B enables diversity and competition in all layers. With specialization (both in operations and also types of finance) the industry becomes more effective, more efficient and less risky. More services mean greater take-up of fiber, making the fiber owners more money and bringing greater overall economic benefit to the area. From experience in Sweden, as well as from various studies, it is clear that Open Access is the way real estate owners make the most money from providing broadband infrastructure. It can result in a 5% premium on home prices, while also maximizing the satisfaction of residents in the area, with both consumers and business users getting the best possible choice and prices for broadband services. In a fiber access network, Open Access should mean the ability for an end customer to receive and choose from multiple types of services delivered by multiple different operators simultaneously. The customer should be able to buy broadband from one company and TV from another, as they wish. Changing service provider should be easy, at the click of a mouse. For service providers, the ability to add their services to the network should be completely open and on equivalent terms for all operators -- no advantages for one, no blocking of another. The essence is to have an open market on the network that makes that network much more attractive to the customer and hence better for the fiber owner. A long definition is needed because of confusion among municipalities and developers and also a trend with operators trying to hijack the term Open Access for marketing purposes (in the same way that lots of customers connected to a copper or coax connection in the last mile are being told they have "fiber broadband"). So if an operator is offering Open Access but you can only get their services on their network, then it isn't Open Access! One incumbent is claiming that this is actually open because you can switch to another provider, but the cost is so high that customers are essentially trapped with the incumbent. That is not truly open either. If an operator is sharing its network using "bitstream" (a wholesale access capacity product) then that is not Open Access -- customers can't see a menu of services from which to choose. Yes, a customer could change to another provider but the pricing can be prohibitive for them and even if a customer does change, then they're stuck with a single provider for all services. Who is trying to play in the Open Access space? There are four generic types of organization that try to offer Open Access. IT companies, Open Access novices and local ISPs that want to reinvent the wheel at your expense. You can expect badly delayed and buggy software that may add a few customers to a small system but one that is not scalable, not robust long term and from a supplier with doubtful long-term commitment. You can also expect to keep paying for even the simplest changes. Hardware vendors similarly may be very keen to sell you some equipment but can then walk away as they don't care that integrating hardware, software etc. and then operating a 24x7 service is not their business. But they have your money by that point, so at least they're happy! The big established telco operator that claims they can "do everything." They are likely to use your infrastructure for their own benefit, not yours, and after signing will simply not care about you or any awkward details agreed in a rush of enthusiasm by their sales people. The only type of organization that can deliver is a committed, experienced and specialized Open Access operator that lives and breathes this business. This type of operation will be proven at delivering at scale (so they can attract brand name service providers) and will have many happy successful projects behind them. So let's get to the fundamentals and figure out how you can sort out the good from the bad. Here are some simple questions that municipalities, property and fiber owners can put to any potential Open Access provider to understand their offering more fully and avoid potential errors in selection. I've added comments after some of the questions to explain why the answers are important. 1. Can multiple different service providers deliver services at the same time over the network? 2. Can end users see these services and select freely from them? 4. Can the real estate developer add their own IP-based services to the system, such as CCTV cameras? This is important, as some operators just want to put their own services on and not help the developer with security, access control and other applications. True Open Access makes adding these things easy. 5. Is the supporting software already developed, stable and proven at scale? If not, this opens up the risk of the classic IT problem in telecoms of long delays, high costs and lots of problems. That won't make a Residents Association very happy. 6. Is it possible to see a demonstration of an existing commercial deployment with multiple service providers and services? A simple request and it's much better to see a live demonstration of a working system than mere promises in a proposal. 7. Is it possible to talk to some existing customers? A good Open Access partner will be happy to let you talk to customers. 8. Do different service providers pay the same price for accessing the network? It is all too easy for a big telco to cross-subsidize services to disadvantage competitors. For example, an incumbent could charge a rental for the fiber to other operators that is 90% of the retail price, making it impossible for any other operator to compete. 9. Can your provider explain what hardware choices they have made and how these help deliver high performance and uptimes? Some components last 75 years between failures while 50% of some components will fail in three years. It is better to know that your provider has thought of this and is choosing wisely. 10. Is the network equipment based on a truly interchangeable technology? If not, the risk is the network may be tied to one hardware vendor -- such lock-in can lead to higher prices over time or lead to problems if the vendor experiences difficulties. 11. Will the system be capable in the future of offering delivering multiple HD (and one day UHD) TV services to end users? Be careful as this can be a trap. If the technology selected is GPON then quite simply the system will not be capable of delivering such services in the future. In Sweden, the home of Open Access, there is not one Open Access operator using GPON -- they all use Active Ethernet. 12. How will the network be maintained? 13. Does the business model mean the provider is committed to the development in the long term or can they run away early (for instance, if you paid for everything up front)? 14. What track record does the provider have? It's better to work with someone that has seen and done it all before. If the provider can't deliver against the above, then you're risking having lower penetration and unhappy customers that don't have the control or range of services they desire.